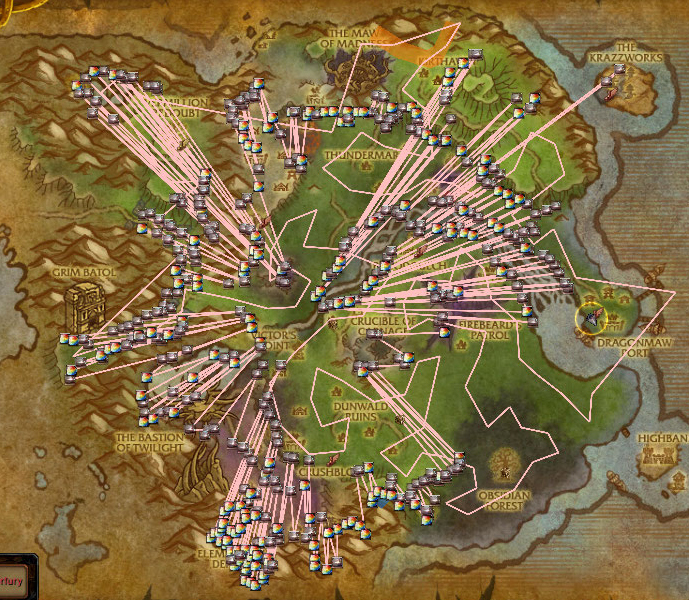 Since patch 4.3 went live the market for gems has improved quite a lot making a World of Warcraft add-on like “Routes” extremely useful. What routes does is take node information from a mod like Gatherer and figures out the shorted path to visit each of those nodes. For the CS/IT/Programmer folks out there, it figures out the “Traveling Salesman Problem” for you. It works for mining and herbing nodes as well as a few other things. First things first. You will need information about node locations. The easiest way to do that is to already have run Gatherer for a while. 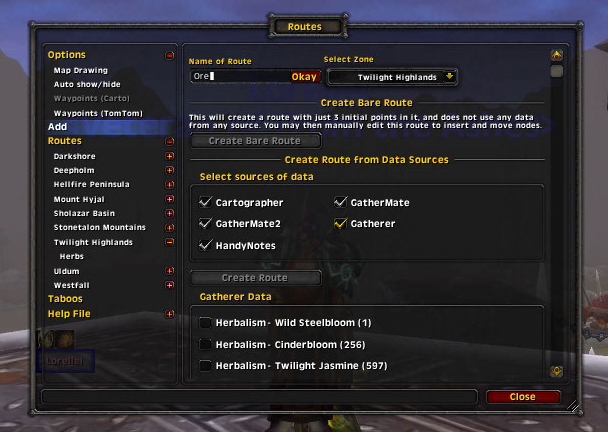 Gatherer keeps the information about node locations in a format that Routes can read. Gathermate is another add on that does this but I haven’t used it. 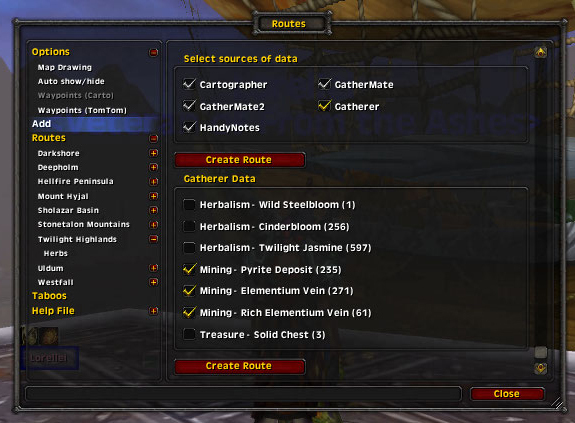 Also if you want you can get the Wowhead GathererDB, which has all of Wowhead’s node information in it. Once you have node information it’s pretty easy to set up the Routes add on. 1. Type /routes to bring up the configuration panel. You’ll be asked to name the route so that it can be saved. In this case I picked “Ore” since that’s what we’ll be using this route for. Once you’ve named it, click the Okay button. 2. Scroll down a bit on the panel and you’ll see options to select what type of nodes the add on will use for this route. I selected the ore that I want to mine in this zone. Click the “Create Route” button just under the selections that you made. 3. If you need to bring the panel up again, type /routes. On the left side of the panel is a list of all of the zones that you have routes for. Expand the zone that you’re in and select the route that you just created. In this case “Twilight Highlands” and “Ore.” That brings up the settings for your route. 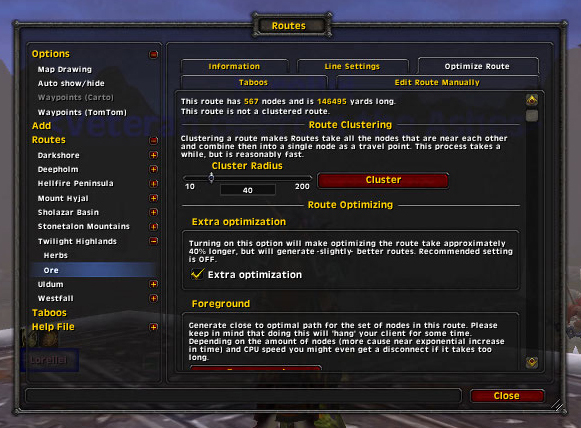 On the top right hand side click the “Optimize Route” tab to bring up your optimization options. 4. The default settings are usually fine. I have “Extra Optimization” checked but it isn’t really needed. Scroll down to the bottom of the page and click the “Background” button under the Background section. This is your safest bet as it does its computations in the background letting Wow do its functions as well. If you click Foreground then Routes takes all of your resources while it figures out the shortest path and if a large number of nodes are in the zone, you may be disconnected from the server. Now you should have a nice path to follow when you bring up your map. 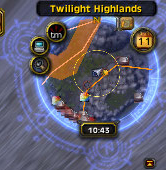 The path is also visible on the mini-map so it makes flying that path very easy. You just follow the line on the mini-map. 5. There are a number of optional setting that you can play around with like changing the color and width of the line. 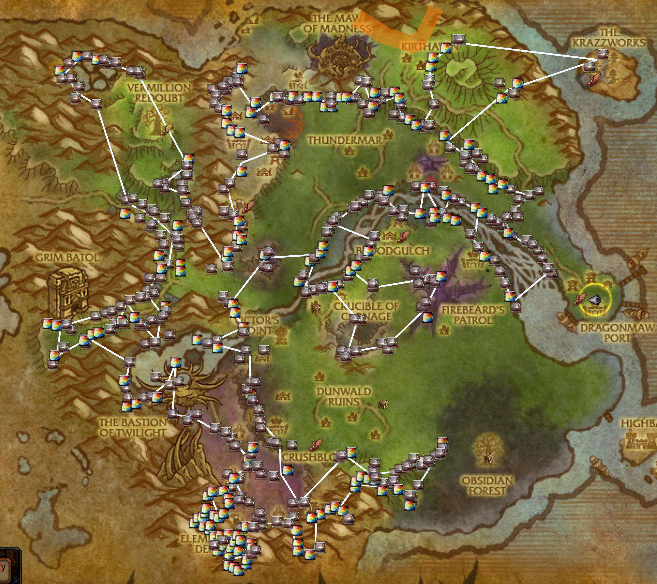 I changed this route to Orange so that I could tell the difference between my Ore route and my Herbs route. That’s it! Now you just have to follow the route and gather your resources!